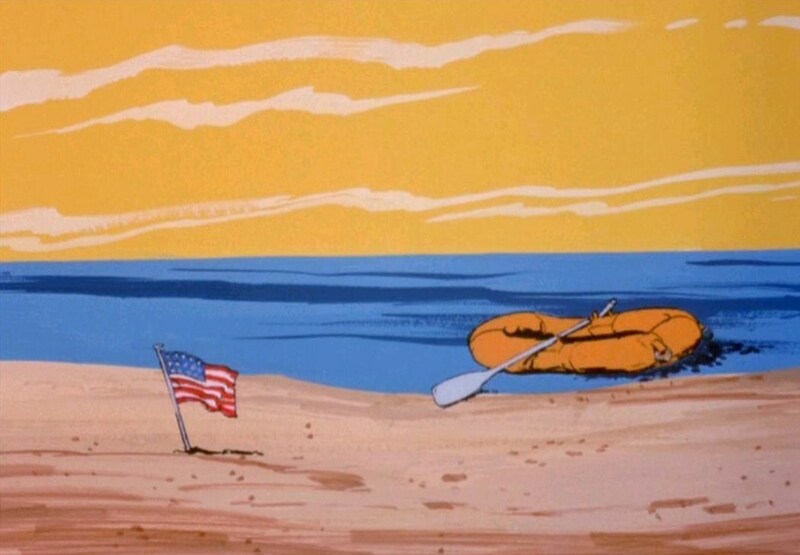 Return to the Planet of the Apes (1975) is a Saturday morning TV program developed for television by David De Patrie and Fritz Freleng. It assimilates and re-invents characters, plot lines, devices and technology from all previous incarnations of the once-popular franchise, including the Pierre Boulle novel, the 1968 film and sequels (Beneath, in particular), and even the short-lived 1974 live-action TV series. Because frankly the buzz from the old genre press wasn’t good. Going back to Fantastic Television a reference book from 1977 that I've always adored, the author writes in a summary review of the NBC series that it “was a not very exciting animated version of the short-lived CBS live-action series,” and that the artwork and plots were “simplistic.” (page 177). The comment about the art work is correct, and yet some times "simplistic" can also mean...interesting. 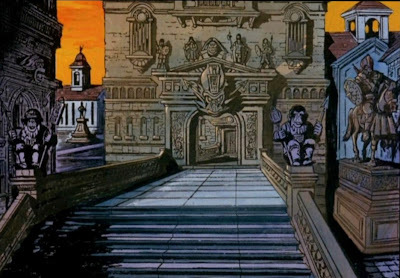 Once you get used to it, the design of the cartoon series is actually pretty terrific, at least in a baroque kind of way. 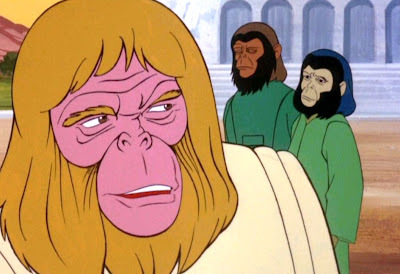 Humans may be hunted as legitimate sport, Zaius concludes, or brought into the city to perform “menial tasks.” They may even serve as domestic pets, but Zaius will not demand their total destruction. However, on an ominous note, he warns that Article 18 of the “Book of Simian Prophecy” demands that man must be destroyed at any cost if he develops the power of speech. In other words, this is a temporary victory for Cornelius’s cause, and for the primitive, mute, stone-age humans who populate caves outside the technologically advanced ape-city. For instance, the imposing ape council building resembles nothing so much as our own Capitol Building where Congress deliberates when it isn't shutdown. 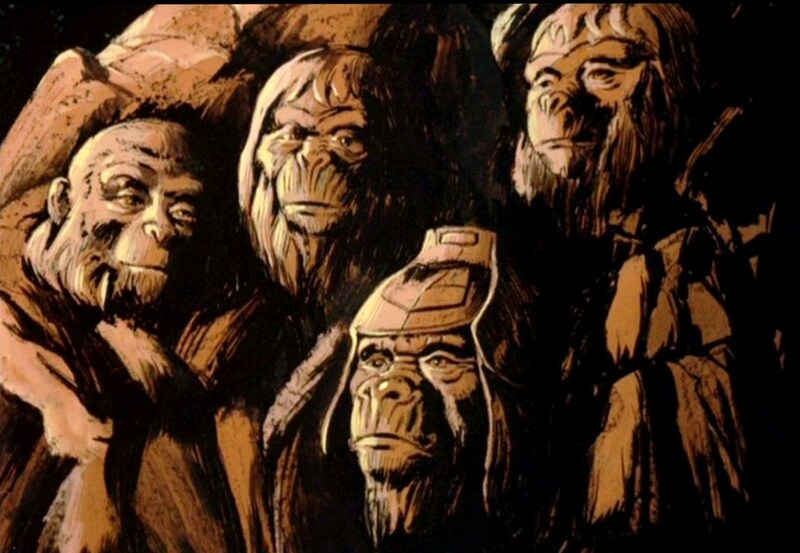 Since this is a re-imagination and updating of Planet of the Apes for the mid-1970s, not only is there the burgeoning nod to gender and racial diversity (this was the era of the equal rights amendment...) in the make-up of the astronauts, but the focus on the Council and its proceedings reveals a more bureaucratic bent to the apes. The animation is limited perhaps, even crude but these limitations are marshaled as a strength on the program. Overlapping views, double exposures, intense close-ups, insert shots and first person subjective point-of-view shots all provide a texture to the desperate march through the wasteland. This march ends, appropriately, with the sighting of an Ape Mount Rushmore. Another new touch, but again one that along with the ape metropolis reveals the ape talent for mimicry (monkey see, monkey do) and is therefore thematically valuable; a subconscious reminder that all of the simian accomplishments are built on “aping” human society. 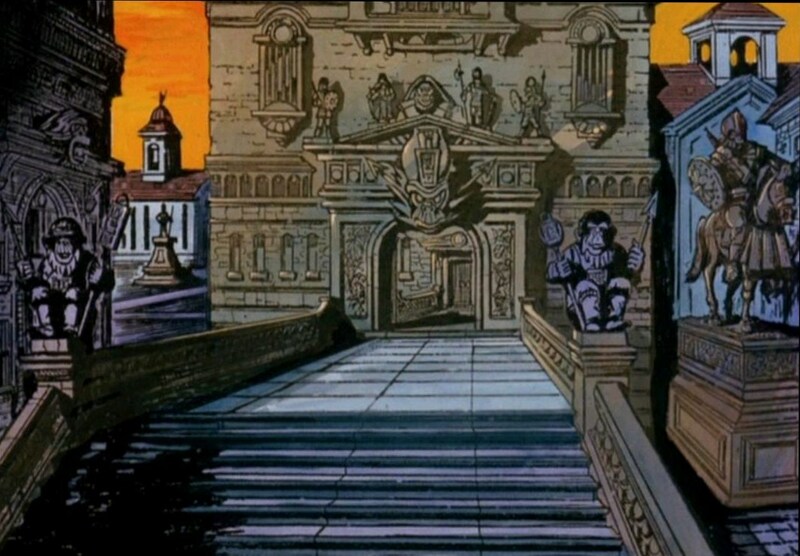 Later episodes go further with this idea, visiting "The Tomb of the Unknown Ape" or mentioning the famous author, William Apespeare. One episode, "Invasion of the Underdwellers," even casts eyes on -- at least briefly -- a simian Mona Lisa. 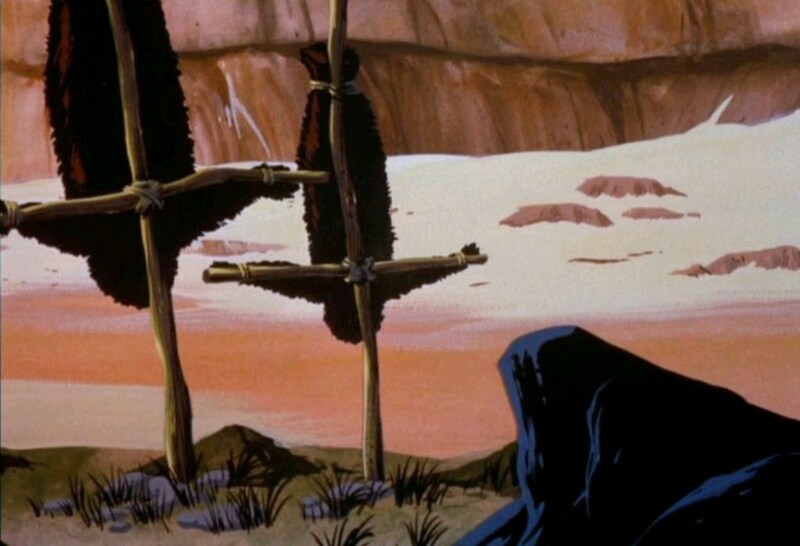 That’s where the first episode ends, but already, the attentive viewer can detect how this canny re-imagination assimilates the critical aspects of the Planet of the Apes mythos with something akin to 20/20 hindsight. 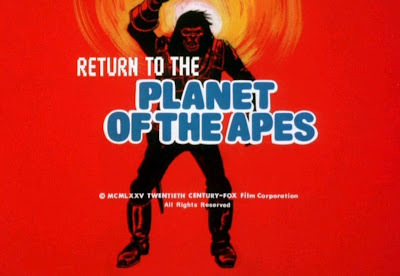 Instead of making up the saga as it goes (a deficit of the otherwise outstanding motion picture series…), Return to the Planet of the Apes accounts for -- from the very beginning -- the mutants in the Forbidden Zone (here termed “The Underdwellers.”) It also employs familiar characters in new ways and in new situations, and even incorporates movie imagery to vet the story. Zaius is no longer a hypocritical religious zealot, but rather an equalizing force of moderation in Ape Society…almost heroic, actually. “The free ape is he who does not fear to go to the end of his thought,” he even states; an ideal that the movie’s “chief defender of the faith” could never get behind. This is actually a significant structural change as well as a symbolic representation of the left/right divide in our culture. Why? Because with Zaius moderating pacifists and war-mongers, we can more logically believe that humans (particularly the astronauts) can continue to escape and outmaneuver a technologically advanced simian culture. The whole planet isn’t out to kill them; they do have allies. Dr. Zaius is even referred to by his enemies, the Underdwellers, as being "just...for an ape," and again, this is a sea change in the character's depiction. That’s important, because long time Planet of the Apes fans will remember some of the more dramatic gaps fouling continuity in the film series. In Planet of the Apes, for instance, it is the year 3978 when Taylor arrives, but when Brent arrives on his heels in the follow-up, Beneath, it is magically 3955. Similarly, there are discrepancies between Escape and Conquest in the story of how the apes ascended to superiority in man’s world. Cornelius’s story involves an ape named Aldo (whom we meet in Battle), but does not take into account the true ape revolutionary, Caesar. Coming at essentially the end of the apes cycle, Return to the Planet of the Apes benefits from knowing everything that came before. Indeed, this is the only valid reason for the re-imagination of a franchise. Taking what worked in one production and maintaining it; and taking what didn’t work and improving upon it. It must be done, however, with a degree of love, patience and restraint involving the material. I feel like I see all that here. Notice that there is not merely change for the sake of change; that characters have not miraculously switched sexes, and whole swaths of mythology have not been removed or altered to suit a developer"s ego, or need to be "creative." What I’m suggesting is that fundamentally there is a respect in evidence here for the the productions that came before, for the Apes mythos. So yes, a re-imagination can work, and this dedicated animated series is one example, at least in its first chapter, where it did so. This factor plays out in some funny ways throughout the series, as we'll see in the weeks ahead. Next weekend: "Escape from Ape City." I watched this series every Saturday morning as a boy in the '70s. It was a welcome continuation of the PLANET OF THE APES franchise after the previous seasons cancellation of the primetime live-action CBS series. I completely agree with your review of Return to the Planet of the Apes: "Flames of Doom" episode. The animation limitations was not a problem with me because the intelligent scripts building upon the previous five films and live-action series, even the Pierre Boulle novel, are all that mattered to me. I only have one major problem with this animated series which was why they chose not to use the same A.N.S.A. spaceship design that we saw in all the previous films and series. I know this animated RETURN TO THE PLANET OF THE APES series did not have an A.N.S.A. spaceship, but instead a N.A.S.A. Venturer space capsule [I know it sounds grammatically wrong, but it is not the Venture, but the Venturer] that looks like an oversized N.A.S.A. Mercury capsule. Since the real Space Shuttle Orbiter was two years away from atmosphere testing they might have chose that instead. 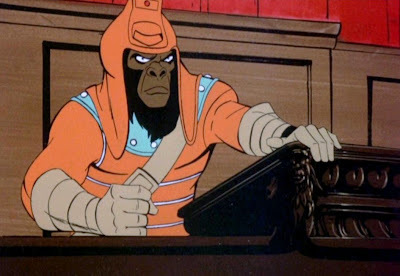 However, RETURN TO THE PLANET OF THE APES series should have definitely had an A.N.S.A. spaceship as we saw in the live-action films and live-action TV series. I can still vaguely remember watching a couple of episodes of this show on TV as a kid in the mid-1970s. 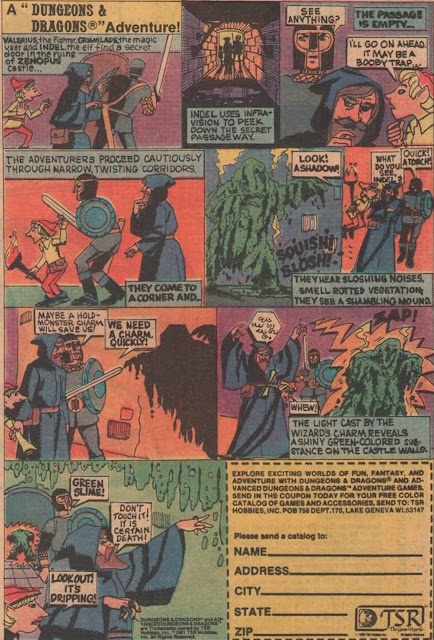 I loved the PotA movies, Mego dolls, and the live action TV show (which I saw as a kid in syndicated re-runs years later) as a 5-10 year old boy. But at the time this cartoon adaptation didn't impress me. I really liked the art (if not the animation). At the time I thought the lead astronaut looked like Race Bannon from "Jonny Quest," another personal favorite cartoon. Only many years later did I learn that Doug Wildly was involved with both shows. But all the dialogue was spoken in this really quiet, unemotional way, which I thought gave the show an off-putting, 'bizarre' quality. I'd never heard of the Boulle novel at that time, either. So apes living in 'normal' houses, and driving cars and airplanes, some wearing fedoras and business suits, did not impress me as a child. About a decade ago or so, I happened to discover the DVD compilation on Amazon.com and bought it. I watched the first 10 episodes again, for the first time in 30 years, but then gave up on it without bothering to watch the final 3 shows. I still loved the art, but the extremely limited animation wasn't to my taste. And that oddly 'sedated' dialogue still didn't sit well with me.